I have a secret for you. 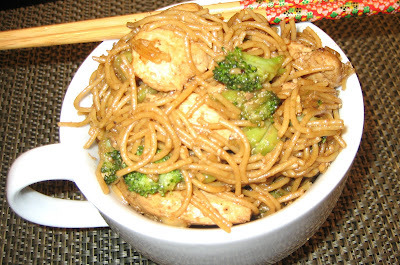 The key to moist, velvety chicken in a stir fry is to first coat the chicken with an egg white and cornstarch mixture. This prevents the chicken from overcooking and becoming dry. I had some cooked noodles and was looking for a quick dinner to throw together really fast. Use whatever you have for vegetables and use whole wheat pasta or brown rice and you have a quick, healthy dinner with tons of flavor. You would think by my recent posts that I do a lot of Asian cooking. I really don't, but in an attempt to avoid ordering take-out to satisfy my husbands cravings, I've been making a few things. In a bowl, mix together the egg white, cornstarch and salt. Add the chicken and coat lightly using your fingers to be sure all the pieces are coated well with the mixture. Let sit at room temperature for 30 minutes. Microwave the broccoli for 3 minutes to soften. In a wok or large non-stick frying pan, heat oil to a medium/high heat, add the chicken and cook through browning all sides. Add the broccoli, teriyaki and pepper flakes and toss with the chicken for 2 minutes. Add the noodles or rice and toss until ready to serve.